Ideal for the family traveling who want the comforts of home. We traveled in our van for 10 months with two children and absolutely loved it. We'd love you to share a similar experience. Not sure whether you'll always stop at a caravan park or not - well this van is ready to go off line! Required, and not included. Must be supplied by the hirer. Discuss electronic brake requirements with owner. 12 pin flat plug required or adapter to suit. You can't stay on-site in this Caravan. AL-KO Electronic Stability Control system fitted to caravan. - Pantry kit - oil, salt, pepper, tea, coffee, detergent, hand soap, kitchen paper, toilet paper. - Linen - mattress protectors, sheets, doonas (Adairs kids sleeping bags on bunk beds), pillows, towels, tea towels. (*If 3 nights or less there is a $30 charge, if 4 nights or more linen is free). Van has a built in washing machine. No smoking at any time. Please empty toilet cassette prior to returning the caravan. Bunk beds are NOT full length, but are okay for children or adults up to 160cm. Minimum hire during school holidays is 5 days. Our van was our home and we expect you treat it like it is your home. Enjoy! No 4WD tracks or dirt roads, graded dirt roads for short distances to arrive at a campsite are okay. Empty toilet cassette before returning. All crockery, cutlery and cookware should be cleaned, dried and returned to cupboards. 7 day minimum hire in school holidays. Minimum hire 3 nights however this is at $110/night off-peak. The van was great and easy to set up. Most things you needed for a short or longer trip away. From the get go Corinne was really helpful and informative. They spent the time when we picked it up to show us the ins and outs so we could set up seamlessly when we got to our destination. Highly recommend to anyone wanting a great holiday. Thank you Corinne for being so genuine, helpful and understanding. Our family will certainly return to hire your van next time. Currently a stay at home mum of 3. Why I love camping: As a family of four we planned on a year off in our caravan. It was an experience of a life time, however cut short and after 10 months as we headed home for the arrival of our third child! 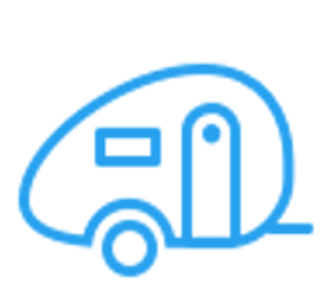 We have had plans to sell our van but we are not totally committed as this caravan represents some of our best memories as a family and we are keen to make many more. Australia is an unbelievable place and we have so much we'd still like to see. Favourite camping destination: So many but in general I loved all our travels in Tasmania. I would recommend a trip on the boat - it's a beautiful state.